Public domain. The color photograph that won Prokudin-Gorsky an audience with the tsar: Leo Tolstoy in 1908, two years before his death. Library of Congress, Prokudin-Gorsky collection. 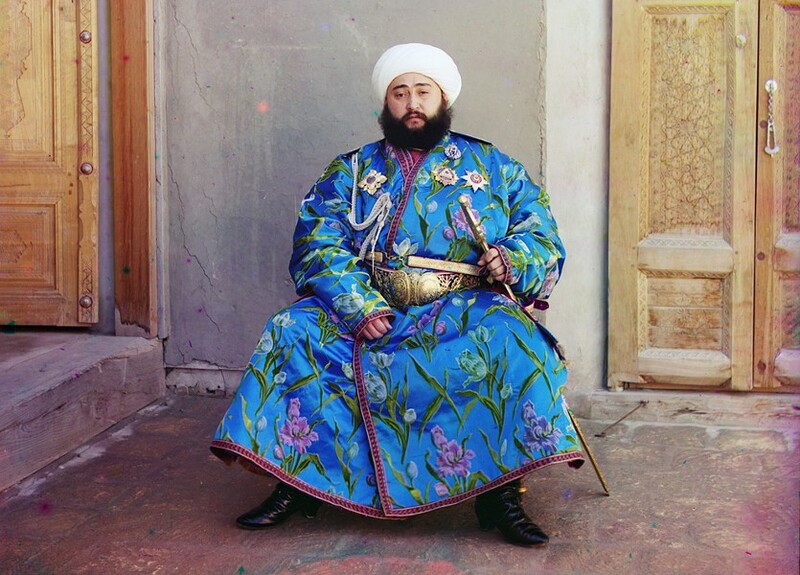 Emir Seyyid Mir Mohammed Alim Khan (1880-1944), Emir of Bukhara (in present day Uzbekistan), 1911. Top (or Left): Digital file from Prokudin-Gorsky's glass triple negative. Bottom (or Right), digital color composite from digital file from glass negative. Library of Congress, Prokudin-Gorsky collection. The Book of the Lantern, T.C. 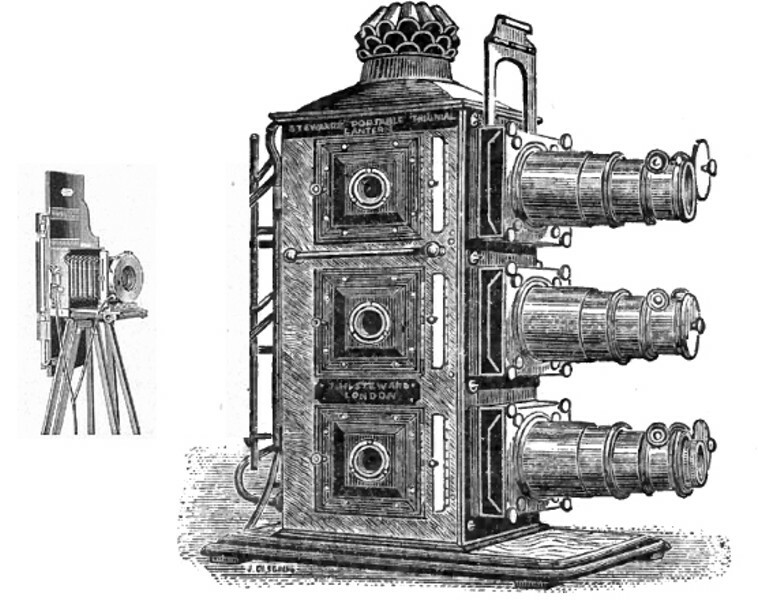 Hepworth, 1888 Camera similar to the one used by Prokudin-Gorsky; and three-lamp "magic lantern." Three black and white slides, projected onto a screen through red, green and blue filters, re-create color images. Library of Congress, Prokudin-Gorsky collection. Harvesting hay near the Mariinskii Canal, 1909. Prokudin-Gorsky would have had to persuade the peasants to stay quite still for about a minute, while three photos were taken through color filters. In the spring of 1909, Russian photography pioneer Sergey Mikhaylovich Prokudin-Gorsky got the break of his life when he was invited to show his latest images to Tsar Nicholas II and family. 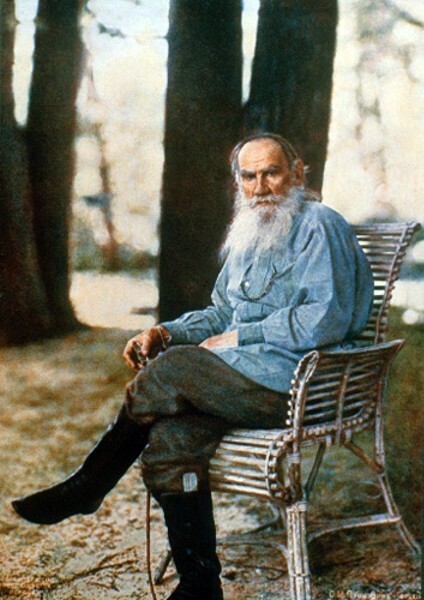 What had caught the tsar's eye was a color photograph of aging novelist Leo Tolstoy taken by Prokudin-Gorsky the previous year. For Prokudin-Gorsky, the invitation was an opportunity to obtain the tsar's backing for a dream long nourished by the 46-year old photographer: a visual record of the vast Russian Empire, from Siberia to Samarkand, from the Caucasus to Murmansk. Convinced of the worthiness of the project, Nicholas II arranged for travel permits and the use of a luxury rail car equipped with a photo lab. During the following years -- almost until the 1917 revolution and the subsequent murder of the royal family -- Prokudin-Gorsky traveled extensively throughout Russia, taking some 10,000 photographs -- the majority in color -- at a time when the science of color photography was in its infancy. He used a camera of his own design which took three black and white images, in relatively quick succession, through red, green and blue filters. His "film" was a three-inch-wide, nine-inch-long glass plate coated with light-sensitive silver bromide. When developed, the three negative images could be turned into positives (by contact printing) for simultaneous projection through a "magic lantern" projector equipped with red, green and blue filters. By superimposing the images onto a screen -- essentially reversing the process by which he had taken the photograph -- Prokudin-Gorsky was able to enchant his audiences with what was then a near-miraculous sight: life-like, color depictions of the original scenes. The glass plates were also used to make printing plates for color postcards, the smartphone photos of the day. Prokudin-Gorsky left Russia shortly after the 1917 October Revolution, eventually settling in Paris where he continued to refine color photography and movie-making techniques, and to give slideshow lectures based on his epic travels in pre-revolutionary Russia. He died in 1944 at the age of 81, leaving a unique graphic legacy for posterity. When he left Russia, Prokudin-Gorsky was able to bring -- or smuggle out -- much of his work. After his death, most of it ended up in the basement of a Paris apartment building until, in a far-seeing act of wisdom, the Library of Congress purchased the material from his heirs for about $5,000. In 1948, some 1900 negatives and 700 prints were shipped to the United States. Due to the difficulty in reproducing high quality prints from the negatives, only a few hundred were initially used for exhibits and books. That was before the era of digital photography. In the last 10 years, all of Prokudin-Gorsky's Library of Congress material has been digitally scanned. Experts combined his triple-images using custom-designed computer algorithms, which compensated for the differences in exposure and eliminated most of the color "ghosting." This was caused by the images being taken sequentially over a period of a minute or so: people moved, trees blew in the wind and sometimes the camera was inadvertently moved between exposures. Ironically, the digitally manipulated images that we can now marvel at are better than those seen by slideshow audiences a century ago. Not only has it been possible to minimize ghosting, but Prokudin-Gorsky's color registration challenge -- to perfectly match the projected red, green and blue images -- has been eliminated, thanks to digital processing. Additionally, the colors we now see are crisper and more vibrant than he could project onto a screen or have printed for postcards. Barry Evans (barryevans9@yahoo.com) marvels at the inventiveness of the process that Prokudin-Gorsky used, as much as at his results. (1) The color photograph that won Prokudin-Gorsky an audience with the tsar: Leo Tolstoy in 1908, two years before his death. (2a) and (2b) Emir Seyyid Mir Mohammed Alim Khan (1880-1944), Emir of Bukhara (in present day Uzbekistan), 1911. Top (or Left): Digital file from Prokudin-Gorsky's glass triple negative. Bottom (or Right), digital color composite from digital file from glass negative. (3) Camera similar to the one used by Prokudin-Gorsky; and three-lamp "magic lantern." Three black and white slides, projected onto a screen through red, green and blue filters, re-create color images. (4) IF SPACE ALLOWS Harvesting hay near the Mariinskii Canal, 1909. 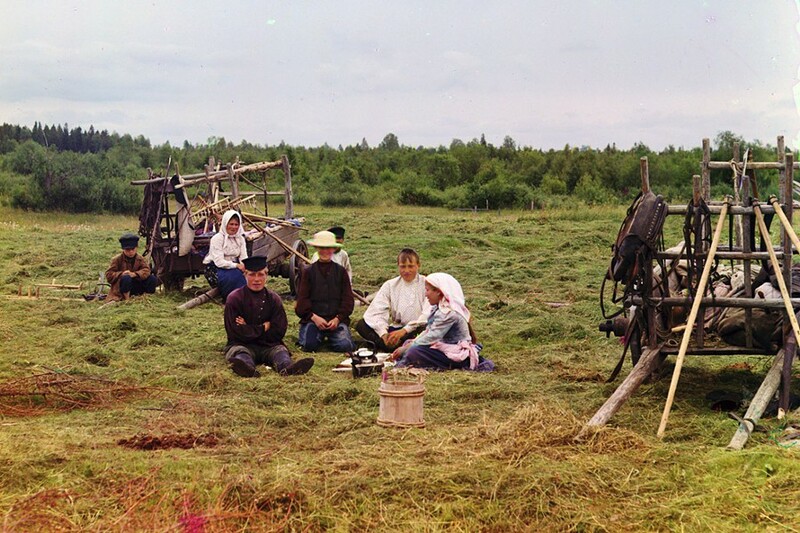 Prokudin-Gorsky would have had to persuade the peasants to stay quite still for about a minute, while three photos were taken through color filters.